Holding a 3:1 chip advantage during heads-up play at the 2017 Aussie Millions main event, Shurane Vijayaram raised to 350,000 from the button and was called by Ben Heath in the big blind. The flop came down 9 7 6 and Heath checked. Vijayaram bet 400,000 and Heath called. The turn was the 3 and Heath checked again. Vijayaram bet 500,000 and Heath check-raised to 1,390,000. Vijayaram thought it over and eventually made the call. The river was the Q and Heath moved all in for 3,200,000. Vijayaram went into the tank for several minutes before finally making the call. 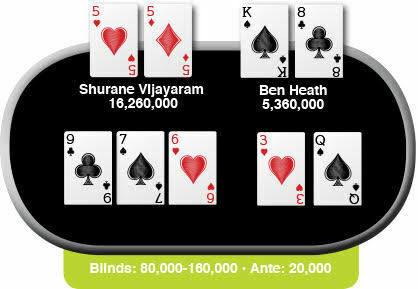 Heath turned over K 8 for a busted open-ended straight draw, but Vijayaram held 5 5 for the winning hand with a lowly pair of fives. How do you feel about Heath’s preflop defense? What about his check-call on the flop? Should Vijayaram be betting the turn after getting called on the flop? What do you think of Heath’s check-raise sizing? Did Vijayaram call on the turn because of his own draw or because he thought he had the best hand? Since Heath moved all in after missing his draw, do you think he would have done the same had he hit the river? What hands are Vijayaram beating? Instead of getting back into the heads-up match, Heath was eliminated by a remarkable hero call from Vijayaram. 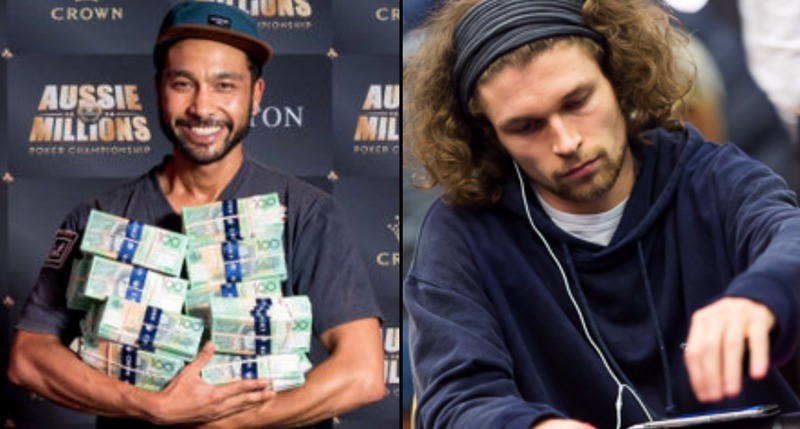 Heath, who was coming off a side event win at the PokerStars Championship Bahamas, earned AUD $1 million ($760,000) for his runner-up performance. Vijayaram, who had never recorded a live tournament cash prior to this event, took home the lion’s share of the prize pool with AUD $1.6 million ($1,216,000) along with the title. The Melbourne local got into the tournament by winning a AUD $130 satellite just days before the main event kicked off. Check out the entire hand below. How do you feel about Heath’s preflop defense? What about his check-call on the flop? The problem with check-calling in this particular situation is Ben's opponent may not be thinking on a high enough level. A non-thinking, less sophisticated play is to check-call with a gut shot and an over card, and to play the hand passively. While we know this was not Ben's thinking or intent, Shurane viewed Ben's check-call as straightforward and read Ben's hand as most likely being a bare 8. This is a case of needing to play the player. Had Ben check-raised the flop he may have gotten a fold. Should Vijayaram be betting the turn after getting called on the flop? If Shurane put Ben on a bare 8 hand, the 3 on the turn didn't help him. However, I question his bet size of 500,000 into a pot of 1.5M from the standpoint of having bet 400,000 on the flop into a pot of 700,000. The 500,000 bet looks weak, and I think Ben picked up on this and committed himself to trying to win the pot. A better bet would have been 1M. He had a double gutter and the chip lead so he should have shut down bottom pair holdings and other draws, in my opinion. What do you think of Heath’s check-raise sizing? Not bad. He bet enough to get a fold and also gave himself enough chips to bluff the river and put pressure on Shurane. Did Vijayaram call on the turn because of his own draw or because he thought he had the best hand? A combo of both; he initially put Ben on a bare 8, but then had to reassess. He still felt his initial read was correct, but also had outs. Since Heath moved all in after missing his draw, do you think he would have done the same had he hit the river? What hands are Vijayaram beating? Synopsis: It is critical to play the player and their skill level and mind, and not assume they think like you. Vijayaram made the hero call because he stuck to his initial read on the flop action.